This product page has been automatically translated. If you have any questions, do not hesitate to contact us. Form and ready for installation. No new hu / required at. With us you get the following free editing material this. Superior quality at a very affordable price! Very high resistance emission - and climate-related corrosion aluminum and silicon alloy of min. Very good absorption of loads by reinforcements of flexible connections. Use the best raw materials thyssenkrupp steel. Have a quiet pot lid at least 2mm thick -use more than most other manufacturers. Accurate adjustment avoids unnecessarily high workshop installation costs which can also be applied with many inexpensive products because they often have to be modified. New goods in the original. Ready to install, no soldering required. Original shape: remove old exhaust, new screw exhaust - finished! 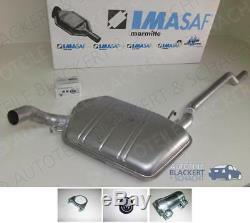 Audi: 893253078a, audi: 893253409d, vw: 893253409d, vw: 893253078a, eberspächer: 95117012, walker: 13956, walker: 72200, bosal: 283-119, tesh: 260012, mts: 01.53030, asso: 04.6008. Guide for the key number. To find the best part for your car, we need key number 2 (or 2.1) and 3 (or 2.2). You will find these in the vehicle registration papers. In the example they are: 30. Our competent team will answer your questions as soon as possible. It takes the codes of your car to determine the appropriate part. Belgium, Bulgariy, Cesko, Danmark, Eesti, Spain, Spain, Britain, Ireland, Italy, Latvia, Lietuva, Luxembourg, Magyarorszag Nederland, Austria, Poland, Portugal, Romania, Slovenia, Slovensko, Suomi, Sverige. Fr: No delivery island possible. Fr: no delivery for the islands. Fr: we do not deliver to the islands. It: not envío has las islas. It: not spediamo nal isolates. Shipping to countries not listed only on request! We send parcels with dpd or nox. Delivery times from Monday to Friday between 8.00 -1 8.00. Selbstabholung is by prior arrangement possible in our shop in hattorfer str. The duration of the packing in Germany work days 1-2, in European Union up to 7 working days. The concrete delivery time of a debay item is specified in the "delivery" section. If you buy several items from us, you can save on shipping. For more details, see above under. There you will have the option to enter a different billing address and features of your vehicle. Thus, we can ensure that the parts ordered to fit your vehicle. If no message less than one hour from us, we ask you to inform us. Please check your spam folder if in doubt. We evaluate your purchase within 4 weeks of delivery of the goods. Auto parts balan & tree gbr hattorfer str. 14, philippsthal 36269 hours of office. A reproduction of it, especially the use of texts, text components and images requires our prior agreement. 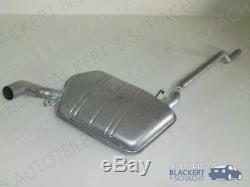 Bsgbr sk2404 (search terms: di: 893253078a, audi: 893253409d, vw: 893253409d, vw: 893253078a, eberspächer: 95117012, walker: 13956, walker: 72200, bosal: 283-119, tesh: 260012, mts: 01.53030, asso : 04.6008), 0588-430, 0588-467, audi coupé 2.3 89, 8 b, 0588-516, audi cabriolet 2.3 e 8 7, b4, 0588-409, 0588-466, audi 90 2.3 e 89, 89q , 8a, b3, 0588-490, audi 90 2.3e 89, 89q, 8a, b3, 0588-408, audi 90 2.2e, 89, 89q, 8a, b3, 0588-407, audi 90 2.0 89, 89q, 8 a, b3, audi 0588-430, 0588-467, 0588-491, cut 2.3 89, 8 b artno: 13.57. 06 accessory: 2 x 250-260, 2 x 255-839, (1 x 265-119). Msd, auspuff, middle exhaust, central silencer. 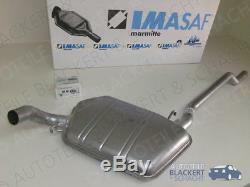 The item "exhaust medium imasaf audi 90 + coupe + cabriolet b3 / 89/80 1988-1994 +" is on sale since Monday 20 August 2018. 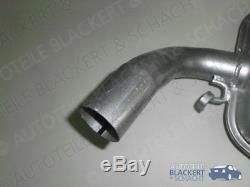 It is in the category "auto, motorcycle parts, accessories \ auto \ parts spare parts \ exhaust systems \ silencer ". 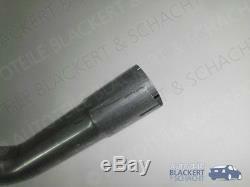 The seller is "kfzteilehandel_blackert_schacht_gbr" and is located at / from de.